I saw Scott Pilgrim today. It was a lot of fun! It seems like it was just yesterday I was checking out Edgar Wright's blog and seeing pics from their first day of shooting or videos of the cast training with fighting sticks for all the awesome action they would be partaking in. 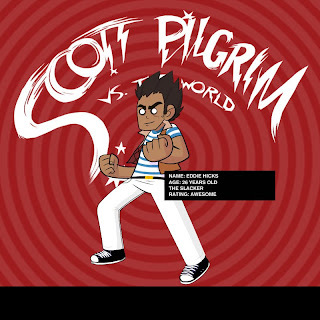 For the record, Scott Pilgrim vs. The World was a WHOLE lot of fun. Portions of the book were trimmed considerably, but understandably so. It could have used a bit more love story, but when there are so many exes to deal with it's tricky to nail everything down at an acceptable pace. Certain beats will win out and become the priority, and they did. I feel Ramona got slightly neglected in character development. Knives was developed just fine, and the actress did a great job with the part. One way to look at it is that in the end the film is about Scott's struggles and battles, his motivations and desires, so in a certain way it wasn't important for the viewer to want Ramona, but rather to understand that Scott wanted Ramona, for better or for worse. And even those wants were questionable towards the end, much like Scott's confusion towards the end of the comic. The best part about what was left out of the film is that people can see it without ever having read the comic, then read the comic and be utterly, completely surprised and delighted by stuff that couldn't make it into the film. There's a lot of story meat that is exclusive to the graphic novels. Go see it twice, I say!